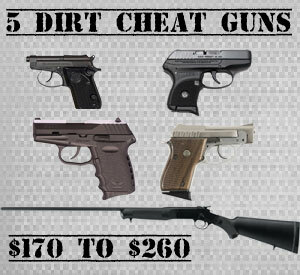 This is our dirt cheap gun list for those of you with limited funds. This list consists of 4 handguns and 1 shotgun. Prices range from $170 to $260. This is a handgun manufactured by Ruger® that weighs only 9.4 ounces when it is unloaded. It is easy to conceal with its 5.16" length, 0.82" width and 2.75" barrel length. Ideal as a short range defensive pistol, it has a 380 caliber and a capacity of 6+1 rounds. Its sleek grip frame is black, high performance with glass filled nylon, and it also is solid, with a blued finish and a barrel made of alloy steel. If this sounds like the gun for you, the price is a comfortable $260. The highly popular and trustworthy Beretta brand is well represented with this 25 ACP caliber handgun. In addition to a capacity of 8 rounds, this unique piece can be found with single or double action. Measuring a mere 4.9" and weighing in at 11.5 ounces, it is compact and precise. The comfortable barrel length of 2.4" makes it simple, safe and practical to use. If you are looking for affordable style, the Beretta delivers with its matte black finish from only $260. The most affordable handgun on our list is from Taurus International with prices starting at only $170. This ultra-light gun is a 22 caliber, double action revolver. It features a long rifle and has a capacity of 8 rounds. This highly compact gun has a small frame, as evidenced by a barrel length of only 2". The alloy from with a rubber grip makes it easy to handle, load and clean. The A lightweight 15 ounce pistol that is known for its reliability. This 9mm piece has a capacity for 10+1 rounds. In addition, this gun comes with extras, including two magazines, spare baseplates, and a trigger lock. Comfort is taken into high consideration as this gun features a barrel length of 3.1" with a Zytel grip. A shiny stainless steel finish adds to the attraction of this pistol. It is highly affordable with prices starting from $260. This affordable single shot shotgun is exceptionally easy to use. Its price starts from $140, and it has a specific gauge of 12. It is easy to handle with a barrel length of 28", a 2 inch chamber and a modified choke. Visually, this gun has a matte blue finish and black synthetic stock. Choosing a gun from our exciting 5 is easy. Each gun can cater to even the most discerning customer. You do not need to spend a large amount for a good gun as just a little education can save you money. We hope this article has been informative. If you liked it be sure to share and like with your friends, it really does help us out.